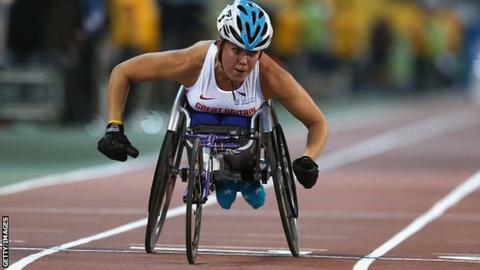 Hannah Cockroft led Great Britain to a quartet of golds on the opening day of the IPC Athletics World Championships. The European, world and Paralympic champion had come to Doha after losing to 14-year-old rival Kare Adenagen in London last month. But she claimed her third successive T34 100m world title in a time of 17.73 seconds - 0.82 ahead of Alexa Halko with Adenagen fourth. "I have come here and done what I said I'd do," Cockroft, 23, told BBC Sport. Former able-bodied sprinter Kadeena Cox came to Para-athletics earlier this year after suffering a stroke which led to a diagnosis of multiple sclerosis. And she marked her arrival on the global stage in style with a world record of 13.59 seconds in the T37 100m morning heats before storming to gold in the final, finishing in 13.60 with team-mate Georgie Hermitage second (13.87). Cox, who is also a talented cyclist, now has a decision to make on which sport she will concentrate on ahead of the Rio Paralympics. But she was thrilled to have come away with gold on her GB Para-athletics debut. "It feels so good to be world champion," she said. "I was lying in bed last night just trying to not to think about it because it is all I wanted and I didn't want to mess it up by over-thinking it." Teenager Sophie Hahn improved her own world record in the T38 100m helped by a blistering start which helped her power clear of the field early on. Hahn, 18, smashed her previous mark of 13.00 seconds, set in London in July with a new time of 12.62 and is relishing the Doha conditions. "I wasn't expecting to go that fast but these are perfect sprinting conditions and I am over the moon," she said. "I've been working really hard on my starts but it has all paid off and I'm thrilled. I now need to go and build up for my 200m." Aled Davies got the GB medal haul started with victory in the F42 shot put in the morning session - a superb achievement for the 24-year-old Welshman after recent hernia surgery. Iran's Sajad Mohammadian had set the pace with 14.54m but Davies took the lead with 14.88 in the penultimate round before improving again to 14.95 with his last throw. "If you had told me ten weeks ago that I would be here and be world champion, I'd have taken that," he told BBC Sport. "I have to thank the British Athletics medical team for getting me here. The rehab was long and I only picked up the shot three or four weeks ago so to come here and deliver a half-decent throw and win, I'm happy with that." There were also bronzes for both Abbie Hunnisett (F32 club) and wheelchair racer Sammi Kinghorn (T53 200m).